The H-2B visa program is a guestworker program that allows employers to temporarily hire migrant workers in low-wage nonagricultural occupations, such as landscaping, forestry, hospitality, construction, and seafood processing, when no U.S. workers are available. 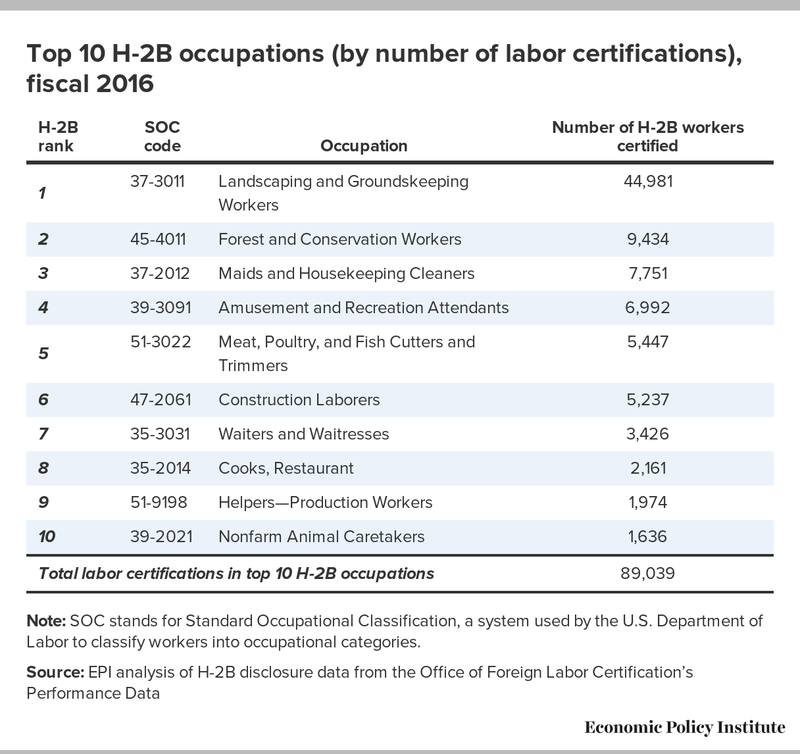 (Table 1 below shows the top 10 H-2B occupations in fiscal 2016, according to labor certification disclosure data from the government.) Since May 2017, the U.S. Department of Homeland Security (DHS), in consultation with the U.S. Department of Labor (DOL), had been considering temporarily increasing the annual numerical limit of visas that can be issued to new workers (commonly referred to as the “cap”) through the H-2B visa program, which is currently set at 66,000. (Note that although the annual cap is set at 66,000, there were approximately 136,000 H-2B workers employed in the United States in fiscal 2016; this is because some H-2B workers remain employed for longer than one fiscal year [Costa 2017b]). Note: SOC stands for Standard Occupational Classification, a system used by the U.S. Department of Labor to classify workers into occupational categories. DHS has the authority to increase the number of H-2B visas because in May 2017 Congress included language in the fiscal 2017 omnibus spending bill (which funds the federal government) allowing DHS to roughly double the number of H-2B visas that can be issued if the agency sees fit. On June 27, 2017, ProPublica reported that a DHS Interim Final Rule was likely to be published soon to increase the number of H-2B visas (Grabell and Elliott 2017) and Bloomberg BNA reported about a week later that the rule was under review at the Office of Management and Budget (Francis 2017). On July 17, 2017, a number of news outlets, including Politico (Hesson 2017) and The Washington Post (Jan 2017), reported that DHS had decided to increase the H-2B cap by 15,000, making the additional visas available to employers who apply for them during fiscal 2017. On the same day DHS and DOL jointly posted an unpublished rule to the Federal Register for public inspection, laying out the procedures and legal basis for the cap increase and noting that the final rule will be published on July 19 (U.S. DHS and U.S. DOL 2017). The language explicitly states that DHS’s decision on whether to raise the cap should be made after consulting with DOL to determine whether “the needs of American businesses cannot be satisfied in fiscal year 2017 with United States workers who are willing, qualified, and able to perform temporary nonagricultural labor.” If not, then DHS “may increase the total number of aliens who may receive a visa” in the H-2B program, up to about a total of 130,000 (which is approximately the number of visas issued in 2007, the year that “the highest number of H–2B nonimmigrants who participated in the H–2B returning worker program” were admitted [Bureau of Consular Affairs 2017]). There are a number of reasons why the H-2B program should not be expanded. There are numerous cases of litigation, reports in the media, and government audits documenting how migrants employed through the H-2B program are often exploited and robbed by employers, and even become victims of human trafficking.2 While these most-egregious examples are clear legal violations, much of the abuse and discrimination in the H-2B program is perfectly legal because employers have been allowed to underpay H-2B workers for years thanks to loopholes in wage regulations (Costa 2016b, 2017a). And because U.S. workers are forced to compete with vulnerable H-2B workers, wages and working conditions for all workers in major H-2B occupations are degraded. As a result, there’s no question that the H-2B program needs major reforms to protect both migrant and American workers—but any push to expand H-2B should be made through the regular legislative process and after a full debate in Congress, so that members are accountable for their votes—not as a fly-by-night provision on a must-pass spending bill that has no identifiable author. In essence, expanding the program with no reform to improve worker protections will allow unscrupulous employers to carve out an even larger rights-free zone in the low-wage labor market that will drag on wage growth. Nevertheless, we can engage with the actual language in the fiscal 2017 omnibus bill that authorizes DHS to increase the cap and consider whether the increase to the H-2B cap was justified. Section 543 of the bill indicates that DHS may increase the cap after consulting with the Secretary of Labor to determine whether there are any “United States workers who are willing, qualified, and able to perform temporary nonagricultural labor.” Leading up to the cap increase announced on July 17, 2017, employers that use the H-2B program and the corporate lobby groups that represent them argued that they are currently experiencing a severe shortage of available U.S. workers to fill H-2B jobs, and that, for this reason, DHS should raise the H-2B cap. But other than anecdotes of shortages—many of which have been reported by the media—very little labor market data or metrics have been offered to prove the existence of labor shortages in H-2B jobs. What do the data have to say? At the national level, it is worth pointing out that there is no evidence at all of labor shortages in the labor market that are significant enough to move national data trends. Despite much-welcome progress in reducing the national unemployment rate in recent years, and despite the fact that the unemployment rate has now reached pre-Great Recession levels, many other labor market indicators signal an economy that still has some way to go before genuine full employment is attained. The share of adults between the ages of 25 and 54 (“prime-age” adults who traditionally have very strong labor force attachments), for example, has just recently clawed back half of the peak-to-trough decline it suffered during the Great Recession (EPI 2017a). Most persuasively, there is no evidence at all of a durable acceleration in the growth of either wages or prices. Full employment as a concept is precisely the lowest unemployment rate consistent with inflation that is stable at the Federal Reserve’s preferred target (2 percent). The U.S. economy has spent most of the past eight years with inflation below this target, and it remains significantly below it even as of May 2017. Crucially, inflation has not been rising in recent months. The story is similar for wage growth. Nominal wage growth has picked up a bit from its absolute nadir in the immediate aftermath of the Great Recession (EPI 2017b), but it remains far below any reasonable target of what it should be in a healthy economy (Bivens 2015), and there is little sign of any durable acceleration. Note: All values are adjusted to 2016 dollars. SOC stands for Standard Occupational Classification, a system used by the U.S. Department of Labor to classify workers into occupational categories. 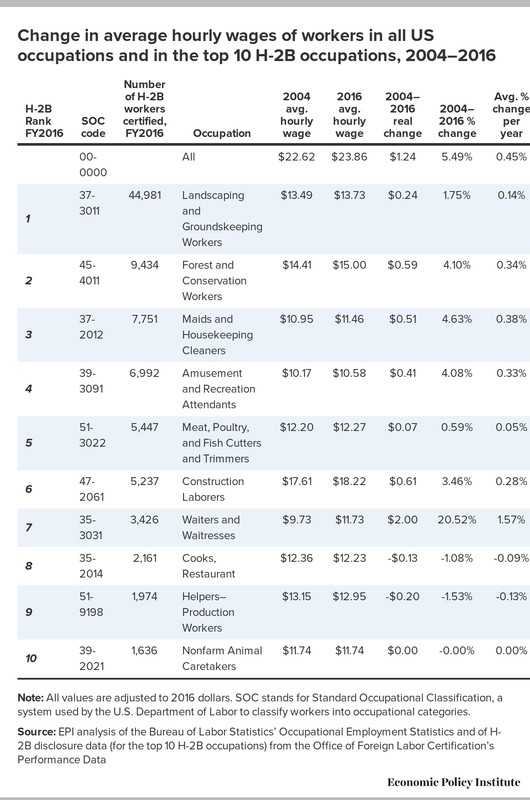 As Table 2 shows, there was little wage growth for all workers nationwide in all occupations—only 5.49 percent or $1.23 over the 2004–2016 period—but wage growth was even slower for workers in nine out of the top 10 H-2B occupations. Wages were stagnant—growing less than one-half of 1 percent annually in all but one of the top 10 H-2B occupations, and wages even declined for workers in two of the top 10 H-2B occupations (“Cooks, Restaurant” and “Helpers—Production Workers”) while one had zero growth (“Nonfarm Animal Caretakers”). The only one of the top 10 H-2B occupations that saw faster-than-average wage growth was “Waiters and Waitresses,” which grew at 1.57 percent per year, for a total of 20.52 percent or $2.00 in 2016 dollars, over the 12-year period from 2004 to 2016. The economy overall, however, has seen wage growth tick upward slightly since 2014, and, consistent with overall trends, wages in the top H-2B occupations rose faster as well since 2014. 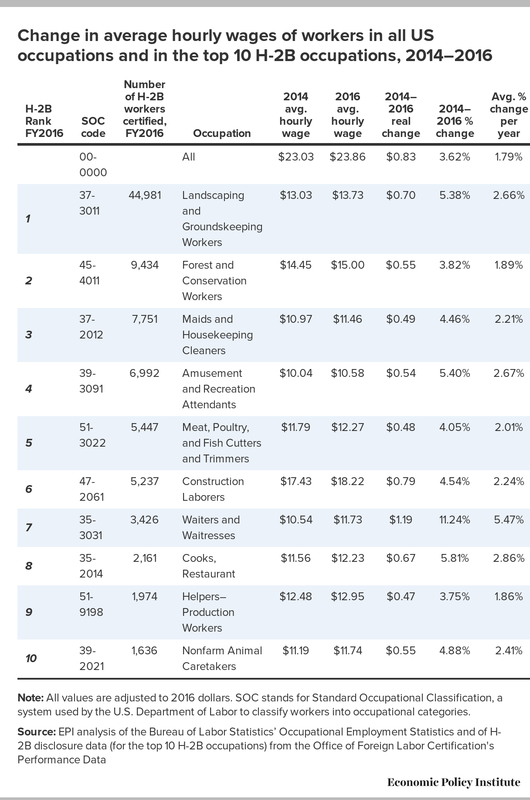 Table 3 below shows the change in average hourly wages for all workers in the United States (in all occupations) and for all workers in the United States in the top 10 H-2B occupations, from 2014 to 2016, adjusted to 2016 dollars. As Table 3 shows, average hourly wages for all occupations grew 3.62 percent over the 2014–2016 period, at an average rate of 1.79 percent (roughly 2 percent) per year. Wages in all but one of the top 10 H-2B occupations grew in the 2 to 3 percent range per year, except for “Waiters and Waitresses,” which had above average wage growth at 5.81 percent per year. While it is clearly an encouraging sign to finally see some improved wage growth in the top 10 H-2B occupations over the past three years, there are a few important caveats to consider. First, wage growth during 2015 and 2016 cannot be solely attributed to excess labor market tightness (i.e., labor shortages) pushing up nominal wages. Instead, inflation-adjusted wage growth in those years was helped quite a lot by a very rapid deceleration of inflation. Overall CPI inflation averaged less than 0.7 percent in those two years, after averaging around 2 percent in the four preceding years. Decelerating inflation will, all else being equal, push up growth in inflation-adjusted wages (Bivens 2016). If we thought this decelerating inflation would continue forever, then maybe we could assume that the 2014–2016 wage growth would be sustainable going forward. But we know that the deceleration of inflation in those years was driven by falling commodity prices (mostly oil). Commodity prices are notoriously volatile, and future years will almost surely see a recovery of these prices, and hence downward pressure on real wages. So, while the 2–3 percent real wage growth in H-2B occupations from 2014 to 2016 was clearly good for those workers, it is far from clear that it stemmed from a tight labor market or that it will reliably persist going forward. Further, even if we ignore these mitigating factors and assume that the improved wage growth during 2014–2016 was due to labor market tightness and will continue, the decent gains made from 2014 to 2016 do not even come close to compensating workers in the top H-2B occupations for the lost decade of wage growth that the economy is just beginning to recover from. It will take at least a few more years of 2 to 3 percent annual wage growth for these occupations to start approaching the average hourly wage levels they would have reached if the Great Recession had not occurred. Heeding calls to raise the H-2B cap to stem the upward pressure of 2014–2016 would essentially be stomping out the only encouraging sign of wage growth these workers have seen over the past decade, and would lock in previous years’ wage declines. 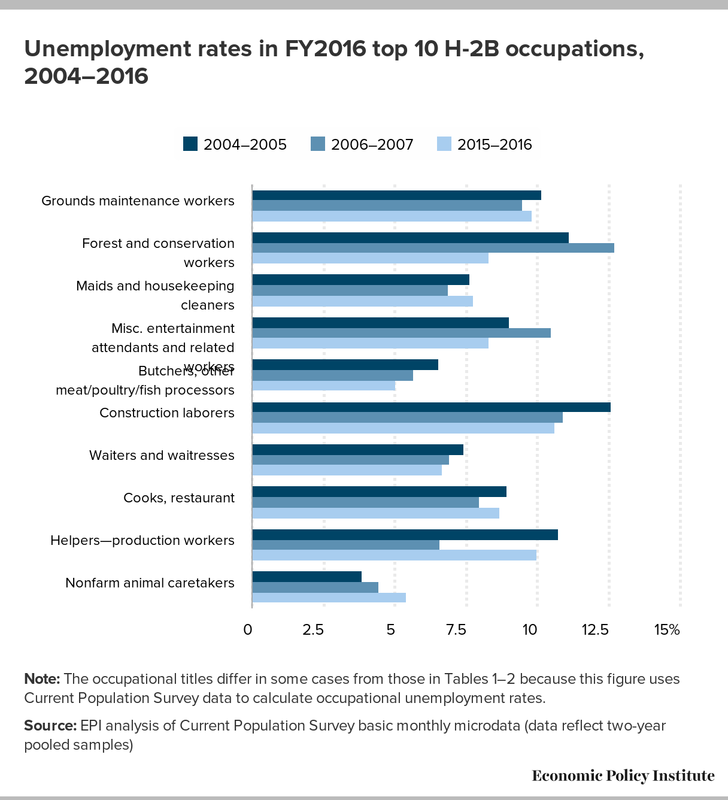 Unemployment rates in H-2B occupations are calculated from Current Population Survey basic monthly microdata, which are jointly maintained by the U.S. Census Bureau and the Bureau of Labor Statistics. These data are not classified by SOC code, but instead use Census codes. However, the H-2B occupations with the 10 largest numbers of certifications in fiscal 2016 match up reasonably well with the same or similar occupations found in the CPS data using the government’s crosswalks between the occupations, even though the occupational titles may differ slightly in some cases. Figure A shows the average unemployment rates in each of the top 10 H-2B occupations listed, for the periods 2004–2005, 2006–2007, and 2015–2016. Two years of data were pooled together to increase sample sizes. The first two periods listed were chosen because they exclude the years of the recession that began in 2008 and its aftermath, and 2015–2016 was chosen because those years represented the most recent data available. Note: The occupational titles differ in some cases from those in Tables 1–2 because this figure uses Current Population Survey data to calculate occupational unemployment rates. Figure A shows that while the unemployment rates in all but one of the top 10 H-2B occupations were high during the 2004–2005 and 2006–2007 periods, the unemployment rates did in fact decline in all but one of the top 10 H-2B occupations between 2004 and 2016, consistent with an improving economy after the Great Recession. Nevertheless, the unemployment rates in the top 10 H-2B occupations are far from being extremely low: The unemployment rates in all of the top 10 H-2B occupations in 2015–2016 were above the national unemployment rate in 2016 of 4.9 percent. Seven of the 10 occupations had very high unemployment rates of between of 7.78 percent and 10.64 percent. In two of the occupations—“Butchers and other meat, poultry, and fish processing workers” and “Nonfarm animal caretakers”—the 2015–2016 unemployment rate was very near the national unemployment rate (at 5.06 and 5.40 percent, respectively), but still slightly above it. The fact that, from 2004 to 2016, wages were stagnant or declined in nine of the top 10 H-2B occupations and only increased significantly in one of those occupations, combined with persistently high unemployment rates over the same period, makes it highly unlikely that labor shortages exist at the national level in the top H-2B occupations. Even considering the uptick in wage growth since 2014, the available evidence suggests that the labor market for H-2B occupations still has a lot of slack, which points to the high likelihood that there are many United States workers who are willing, qualified, and able to perform H-2B jobs. This does not mean that no labor shortages exist anywhere in the United States in these occupations—it is entirely possible that shortages may exist in some states or localities—but the relatively high national unemployment rates in H-2B occupations during the 2004–2016 period suggest that even the employers experiencing a local labor shortage might find available U.S. workers if they recruited outside their city, region, or state, and if they offered more attractive wages and benefits (including offering transportation and housing to workers from outside the local area). Given these realities, DHS’s fiscal 2017 expansion—by 15,000 visas—of a program as flawed as the H-2B program is ill-advised. In addition, the H-2B program still has a legal framework that allows employers to underpay and exploit migrant workers4 and to overlook unemployed U.S. workers5 seeking jobs in H-2B occupations. DHS and DOL should be focusing their resources and staff time on program oversight, on rooting out bad-actor employers who violate H-2B rules, and on protecting the migrant workers who come to the United States in search of better opportunities through the H-2B program—not on processing more visas for H-2B employers. The author would like to thank Josh Bivens for his valuable insights and suggestions, and Jessica Schieder and Zane Mokhiber for technical and research assistance. 1. H.R.244 – Consolidated Appropriations Act, 2017. 115th Congress (2017–2018). 2. See, for example, SPLC 2012; Garrison, Bensinger, and Singer-Vine 2015b; U.S. GAO 2015; and Stack 2015. 3. Wage data from the Bureau of Labor Statistics’ Occupational Employment Statistics (OES) survey data are used for this purpose because OES data are utilized by DOL to set H-2B prevailing wage rates and are therefore superior to other wage data sets for analyzing H-2B occupations or making comparisons between the wages of all workers and H-2B workers. 4. See, for example, Costa 2017a, New York Times Editorial Board 2016, and Bauer and Stewart 2013. 5. See, for example, Garrison, Bensinger, and Singer-Vine 2015a. Bureau of Consular Affairs. 2017. Nonimmigrant Visa Statistics. U.S. Department of State. Bauer, Mary, and Meredith Stewart. 2013. Close to Slavery: Guestworker Programs in the United States. Southern Poverty Law Center, February 18. Bivens, Josh. 2015. A Vital Dashboard Indicator For Monetary Policy: Nominal Wage Targets. Center on Budget and Policy Priorities, June 15. Bivens, Josh. 2016. Should We Care about Slow Nominal Wage Growth When Price Inflation Is Slow? YES. Economic Policy Institute, February 6. Bureau of Labor Statistics. Various years. Current Population Survey. U.S. Department of Labor. Bureau of Labor Statistics. Various years. Occupational Employment Statistics. U.S. Department of Labor. Costa, Daniel. 2016a. “The H-2B Temporary Foreign Worker Program: Examining the Effects on Americans’ Job Opportunities and Wages.” Testimony before the U.S. Senate Subcommittee on Immigration and the National Interest, June 8. Costa, Daniel. 2016b. The H-2B Temporary Foreign Worker Program: For Labor Shortages or Cheap, Temporary Labor? Economic Policy Institute, January 19. Costa, Daniel. 2017a. “H-2B Crabpickers Are So Important to the Maryland Seafood Industry That They Get Paid $3 Less per Hour Than the State or Local Average Wage.” Working Economics (Economic Policy Institute blog), May 26. Costa, Daniel. 2017b. “Modern-day Braceros: The United States Has 450,000 Guestworkers in Low-Wage Jobs and Doesn’t Need More.” Working Economics (Economic Policy Institute blog), March 31. Economic Policy Institute (EPI). 2017a. “Employment-to-Population Ratio of Workers Ages 25–54, 2006–2017.” In The State of Working America. Economic Policy Institute (EPI). 2017b. Nominal Wage Tracker. Updated July 7. Francis, Laura. 2017. “More Visas for Seasonal Workers in Pipeline, DHS Says.” Bloomberg BNA, July 5. Garrison, Jessica, Ken Bensinger, and Jeremy Singer-Vine. 2015a. “‘All You Americans Are Fired.’” Buzzfeed News, December 1. Garrison, Jessica, Ken Bensinger, and Jeremy Singer-Vine. 2015b. “The New American Slavery: Invited to the U.S., Foreign Workers Find a Nightmare.” Buzzfeed News, July 24. Grabell, Michael, and Justin Elliott. 2017. “Is Trump Administration’s Visa Push a Way to Win Health Care Votes?” ProPublica, June 27. Hesson, Ted. 2017. “DHS to Add 15,000 H-2B Guest Worker Visas This Year.” Politico Pro, July 17. Jan, Tracy. 2017. “Trump Officials Open Border to 15,000 More Foreign Workers.” Washington Post, July 17. New York Times Editorial Board. 2016. “Why Guest Workers Are Easily Exploited.” New York Times, July 1. Office of Foreign Labor Certification (OFLC). 2017. OFLC Performance Data. U.S. Department of Labor. Southern Poverty Law Center (SPLC). 2012. “SPLC Wins Record $11.8 Million Judgment for Guestworkers in Suit against Forestry Company.” October 30. Stack, Liam. 2015. “Indian Guest Workers Awarded $14 Million.” New York Times, February 18. U.S. Department of Homeland Security and U.S. Department of Labor, Wage and Hour Division (U.S. DHS and U.S. DOL). 2017. Exercise of Time-Limited Authority to Increase the Fiscal Year 2017 Numerical Limitation for the H-2B Temporary Nonagricultural Worker Program (an unpublished Rule by the Wage and Hour Division and the Homeland Security Department, scheduled to be published on July 19). Document number 2017-15208. July 17. United States Government Accountability Office (U.S. GAO). 2015. H-2A and H-2B Visa Programs: Increased Protections Needed for Foreign Workers. March 6 [reissued on May 30, 2017].